Inflatable stand up paddle boards have many advantages over the traditional Solid Stand Up Paddle board counterparts. The biggest one has to do with convenience as they are easy to store and transport. You can go from paddling to backpack and vice versa in less than 10 minutes. Unfortunately, choosing an inflatable stand up paddle board isn’t the easiest task. There are many factors to consider including value, ease of use, quality of construction, stability, portability and more. The fact that there are hundreds of models on the market doesn’t make it any easier for paddlers to choose. We evaluated ten inflatable SUPs and narrowed down the best models to three. Paddling down the river or lake can sometimes prove boring. For someone who wants to change things up a little and go fishing, take a picnic, surf in a smaller wave or even take a friend, the iRocker 11′ will prove a worthy investment. It is an inflatable stand up paddle board that can be used for waves and flat water conditions. The SUP is fast and stable enough for flat water yet maneuverable for small waves. It is provided with all the necessary extras and has an irrefutable reputation for being durable. 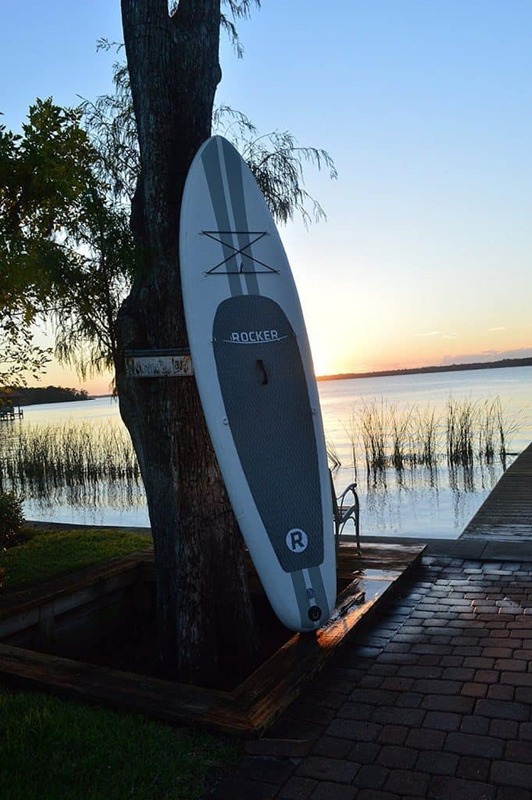 Most reviews online cite the great quality of this SUP, along with all other iRocker paddles. You don’t have to worry about damaging the board when it hits debris. The SUP is constructed using military-grade PVC and reinforced with internal drop stitch. The drop stitch core is six inches thick when fully inflated, hence a superior platform to stand on. This makes it a step ahead of the other SUPs in this post, which are less than 5″ thick. It comes with an EVA deck that is incredibly comfortable. The fact that the deck covers most of the board makes the iRocker 11′ appealing for anyone who wants to do yoga on it. Many customers loved that the deck has a firm grip and, therefore, offers stability for your 4-pawed friends. How well the iRocker 11′ performs depends a lot of where you use it. This is a bit disappointing considering that the board is advertised as all round. And while the 10′ version has better maneuverability, the 11′ is a great inflatable SUP for bigger riders. It can hold up to 385lbs, which is equivalent one large rider or two smaller ones. With a width of 32″ and 6″ of thickness, you can rest assured that the iRocker 11′ will glide effortlessly through the water. This combination gives the paddle much needed stability. The pulled in tail maintains optimum width for balance. It comes with a detachable fin along with two side fins. The detachable fin makes tracking easier while the side fins allow for improved maneuverability and turning in water. Dual action pump: It quickens the inflation process and has a single action pumping option for when the PSI rises. The integrated PSI reading system makes it easy to keep an eye on the gauge. Paddle: The iRocker 11′ is offered with a light, adjustable paddle made from fiberglass. It is the only material that is lighter than the aluminum and carbon fiber. The fiberglass paddle has a plastic edging for added protection against damage. Leash: You also get a leash with a stash spot on the ankle strap that can be used for keys. The coiled leash doubles in length when stretched out, hence plenty of room for movement when you go overboard. Bag: The included bag is spacious enough to hold the bag and accessories. It is a marvelous addition that allows for easy storage and transportation when board is not in use. 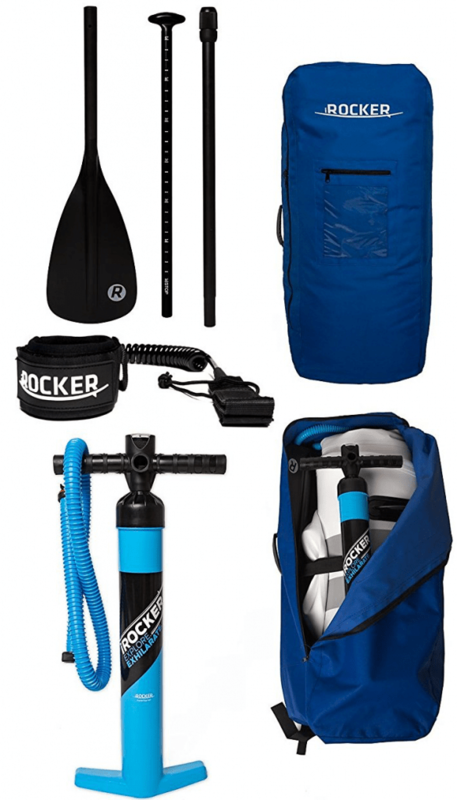 Optional kayak bundle: Those who love kayaking will be happy to know that the iRocker 11′ is provided with an optional kayak bundle. It includes an extra paddle for attaching to the other end of the paddle, thus transforming it into a kayaking paddle. 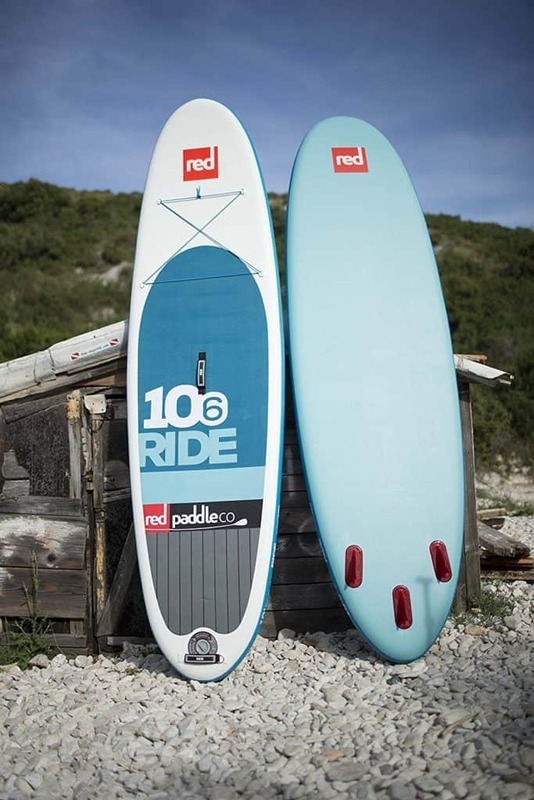 Whether you get the 2016 or 2017 version, the Red Co. 10’6″ Ride paddle has a lot to offer. This review, however, focuses on the 2017 model. The 2016 model was a huge step up in terms of durability with MSL drop stitch, weight and finish quality. On the other hand, the updates that come with the 2017 version focus on details of the board as well as the Titan Pump and bag. This stand up paddle board has a great reputation for durable construction. Red Paddle Co. uses MSL Fusion Technology to combine two layers of composite mesh into a single structure. This is achieved with glue, lamination and a solvent-free process. While you can’t tell the two layers apart, you can clearly see the revised rail, shoulder graphics as well as deck pad. There is even RAM Mount on the nose that’s integrated with a D-ring. The company uses four layers of taping on the rails to provide added strength and resistance to punctures. You can inflate the board with up to 25 PSI of pressure, which is 10PSI higher than most inflatable sups. Its ability to hold more air pressure makes the Red Paddle Co. 10’6″ extremely rigid and strong. In addition, you don’t have to use a lot of effort to paddle. Also featured are three fins that are collectively known as iFins. Their smaller size allows for improved tracking capabilities in white water and surf. Perhaps the most unique quality about the iFin system is that, according to the company, there have been zero warranty requests so far. The Ride 10’6″ is provided with the patented Titan pump. The low volume boards from Red Paddle Co. boards like 9’4″ Snapper and 8’10” are, however, offered with the Red Paddle Co. Ezee HP. The Titan accelerates the pumping process and has an included gauge that you can use to monitor the air pressure. 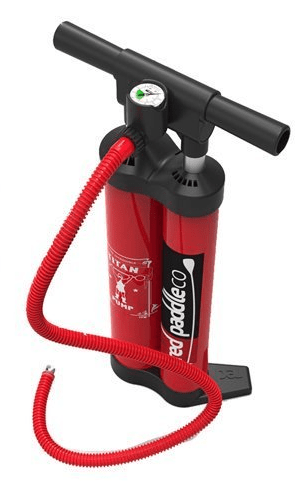 Red Paddle Co. recommended pumping up 25 PSI. Compared to the Ezee HP, the Titan has beefier internal valves, improved handle design and hose adapters. This makes it more efficient at its job. 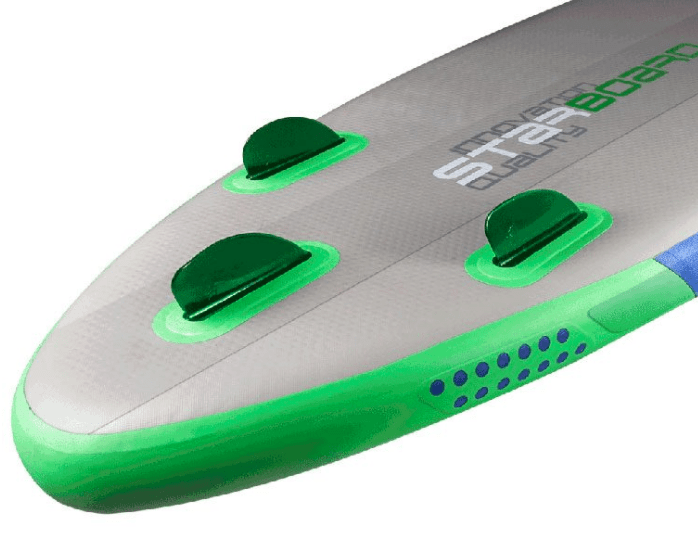 The inflatable sup bag provided with the Ride 10’6″ is an upgrade of the 2016 version. It comes with foil lining, upgraded zipper pulls, internal mesh pocket and bungee tide downs for a 3-piece paddle. It zips all the way along the sides, allowing you to get your gear in and out of the bag easily. The foil lining provides heat protection while the mesh pockets hold the essentials you paddle with. This bag measures 37″ high by 14″ wide by 12″ deep. Therefore, you get more than enough space to store the paddle and included accessories. The Ride 10’6″ has four D-rings on the front that the paddler can use to secure gear. There is also one under the nose for tethering the paddle and another one at the rear end for securing a leash. When it comes to performance, this SUP exceeds expectations. It can be used in slow moving waters, ocean bays and lakes. Its durable construction reduces the risk of dings and cracks when it comes into contact with debris. The board would suit beginners and intermediate paddlers perfectly. Starboard has been manufacturing a series of stellar inflatable and hardwood paddle boards for a few years now. The Astro Atlas Zen is one of their best products and feels like an all-round paddle for a variety of uses. It can be used in lakes, rivers and even the open ocean. One of the things that make the Astro Atlas Zen an exceptional board is its superior construction. It features a 4.75″ drop stitch construction that provides a thicker and more stable core. The double layer of PVC laminate over the core allows for durability. A 2+1 Rail Band feature is what truly makes this paddle unique. The inner Rail Band is airtight and does a great job of keeping everything tight. One of the outer railbands adds to the toughness of the board while the other one acts as a strong compressor. The entire board is covered with heat resistant so you don’t have to worry about what damage will be inflicted by prolonged exposure to sunlight. We love the croc skin-textured deck-pad as it provides a firm and comfortable platform to stand on. Even at 12 feet long, this paddle feels incredibly light and stable once in the water. 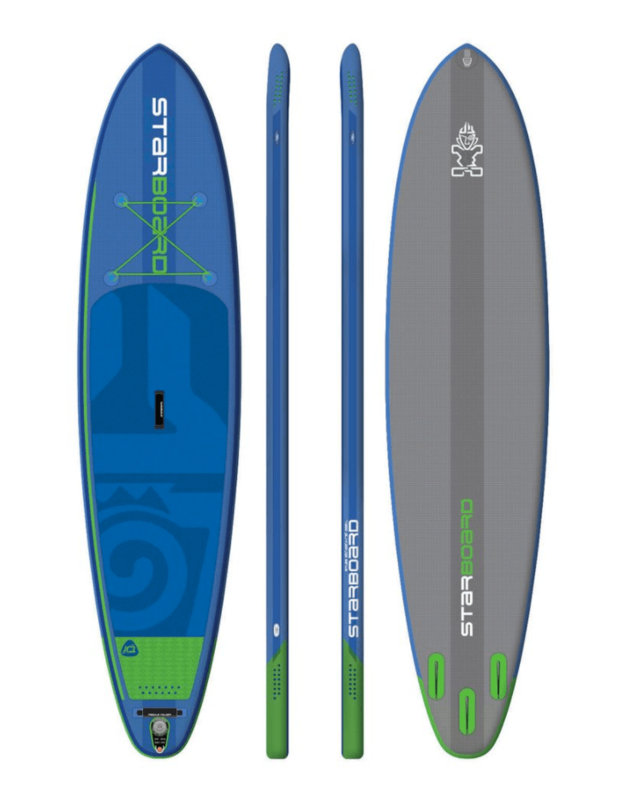 The SUP tapers at the front and rear aren’t common in many models at this price range, and they offer advanced gliding capabilities. 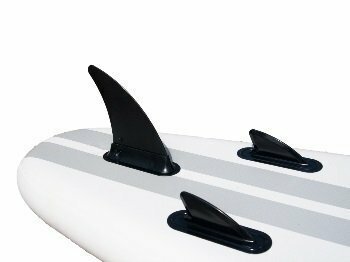 The 2+1 fin setup is quite efficient and allows the paddle to perform exceptionally in varied conditions. It consists of two smaller fins and a central, detachable fin that improves touring capabilities. All you need to do when taking on white water challenges is to remove the larger fin and the smaller ones will give you sharper turning capabilities. When cruising on open waters, maybe just stick with the Single larger center fin for stability. I personally just leave all 3 in all the time, but that is just me. 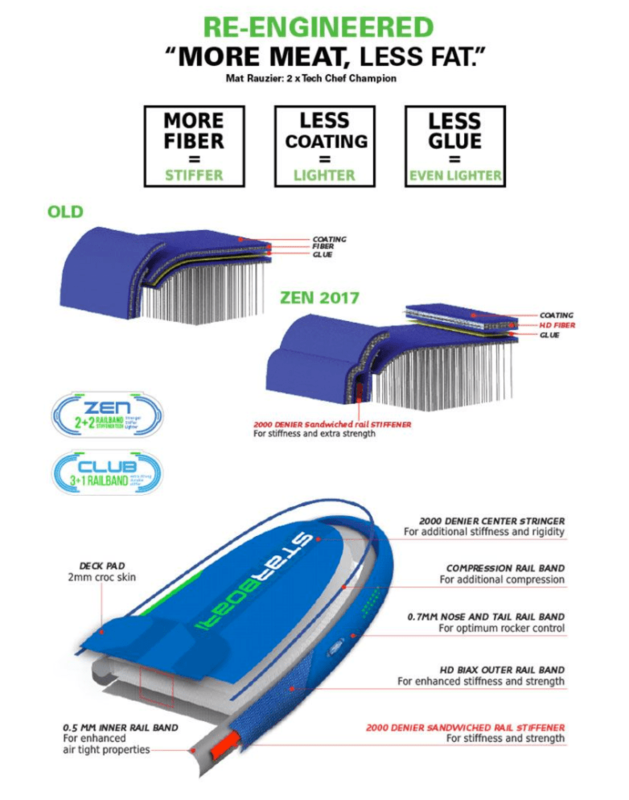 As you can see in the picture to the right, they have broken down the exact design of the Atlas Zen and created a better board than previous models. It is easy to focus on the materials used for construction and how a paddle is built while forgetting the effort put into the visual design. This model sports a minimalist design that will catch the attention of any user. The front is blue in color and has an embedded image of a pacific figurine. The rest of the board is grey in color with the rear and middle dressed up in curved blue lines. There are also neon green highlights around the rim and on various parts of the board that provides a nice contrast. The Astro Atlas Zen is offered with a V8 Dual Action Pump, which is an equivalent of the Red Paddle Co. Ezee HP pump. Some of the features unique to the V8 include the ability to pump air on up and down strokes, hence twice as much air into the board as compared to other pumps. Pulling up proves more difficult as the pressure rises but flipping the red lever switches it to inflation only. You can pump up to 15-18 PSIs of air pressure to achieve optimum performance. 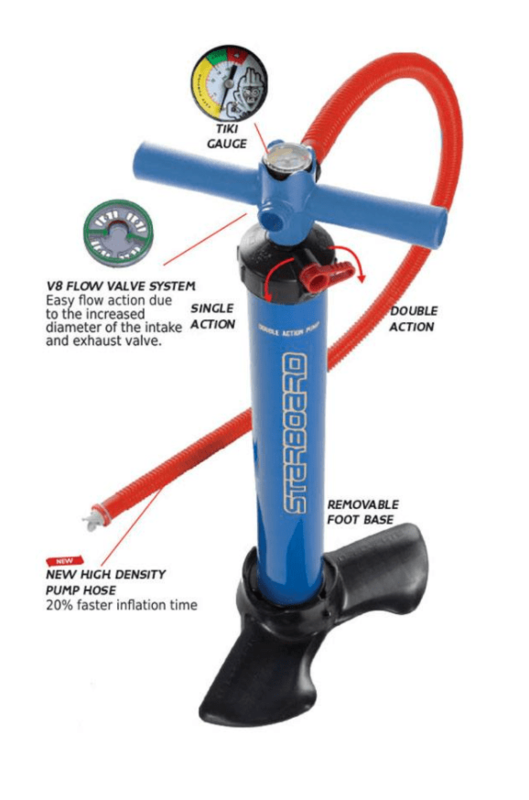 The pump has a removable foot base and ergonomically designed feet. Moreover, the feet pads are contoured for a comfortable grip. We love the handle and the integrated gauge as it makes it easy to track air pressure. It takes less than five minutes to fully inflate the paddle board. 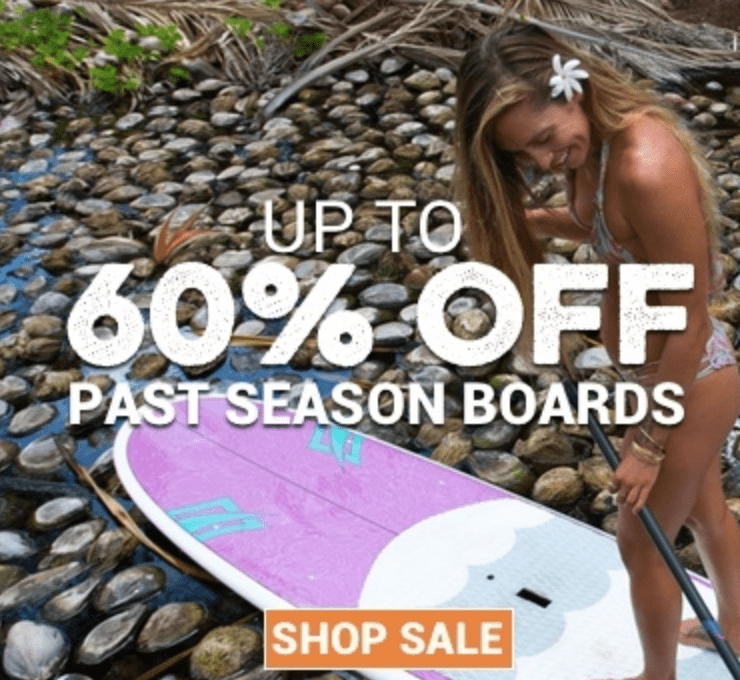 You can never go wrong with any of the paddle boards reviewed. All of them are constructed durably, with high resistance to cracks and dings. They also come with nice accessories, saving you money that would be spent on separate purchases. The most important thing when buying a sup is your personal needs and whether a model meets them. Whatever you choose, don’t compromise on comfort.